How, you ask? A random act of stupidity. Despite having taken AP Chem way back when, I managed to thoroughly confuse Fahrenheit and Celsius and the corresponding boiling points. This led me to think: Perhaps I shouldn’t have spent so much time screwing off with my lab partners and trying to find hilarious ways to make a joke out of each assignment, while still narrowly satisfying the requirements. It’s not that I was ever the class clown or a naysayer of learning (quite the opposite, in fact), it’s just that seating me next to these two particular guys created a volatile comic combination. This is probably why, early one morning, eager to make a loaf of Bob’s Red Mill gluten-free wonderful bread , I (this is so embarrassing) forgot that water, and thus I assumed milk, boiled at 100 degrees…Celsius. I live in America, land of Fahrenheit and non-metric ruling. When I read that the yeast for this bread needed to be added to 110 degree milk, something didn’t click. I’d like to say that I consciously assumed that Bob was suggesting that the milk be 110 degrees Celsius, but the sad, sad, oh so very sad truth of the matter is that I remembered that the boiling point is 100 degrees, and whether that was F or C just never crossed my mind. I was perfectly confident that bringing the milk to a boil would create a warm and cozy bath in which my yeast would foam and flourish. But I killed it instead. Needless to say, my bread never rose, and though it puffed up magnificently in the oven, it promptly slumped into itself as soon as it was removed. It was still crusty and had a great flavor, but was unfortunately dense. This was not necessarily going to be edible as bread, but I made an effort to transform it into something else. It would not have been made in vain. 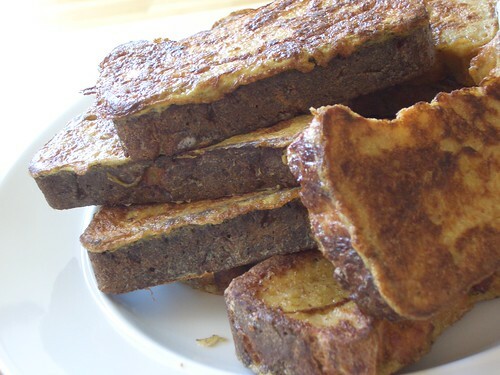 That very morning, my collapsed bread became some tasty French toast. And a day later, we had a light and delicious Almond Peachberry Stratta. But there was a moment before I made those things, before I even put the bread in the oven, where I wondered if any of it would be good. I’ve been feeling this way about certain things in my life lately–like the yeast has been killed and so maybe the bread won’t be what it was supposed to be. And if the bread isn’t wonderful, as I was promised when I bought the package, maybe the French toast and the stratta won’t be good either. And what about sandwiches? Or toast? Those aren’t even options anymore. And it’s one thing when you kill your own yeast, but I feel stuck in a situation where someone who knew the difference between Fahrenheit and Celsius gave me a bowl of boiling milk anyway. It’s been difficult to stand in front of the oven, watching the unrisen loaf baking, and hoping with everything that it will still be good. I’ve been told time and time again not to worry, that it will come out great. What do you know? You killed my yeast. All I wanted was bread, wonderful bread. That’s what was written on the package in big, bold letters after all. And even if the loaf comes out golden brown and swollen with air, will it sink helplessly only seconds later? If it does, will it be enough? Will it have been worth the hour-long baking time? And if it tastes good and we find a way to make something pretty out of it, will it be disappointing to know that it maybe could have been better? This is my dilemma. I’m spending my days crouched down in front of the oven, trying not to remember that lousy lump of dough, stagnating in the pan for over an hour, before I finally shoved it in to bake and said, “Fine, become what you will!” The truth is, even though I’m doubting it will ever become this, I’m still hoping for wonderful bread. Am I being ridiculous? In the meantime, while my metaphorical loaf bakes into whatever it’s going to become, we can all sit back and enjoy some of that Peachberry Stratta. Despite the yeasticide, this was actually very good. You can use whatever you have on hand, risen or not. As long as it tastes good, your stratta will be perfect. In a large bowl, whisk together the eggs, egg whites, milk, sugar, and extracts. Grease a baking dish with the butter. Layer your bread items of choice in the bottom of the dish. 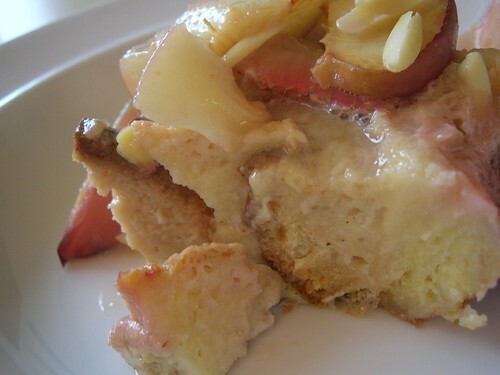 Layer the strawberries and peaches on top of the bread. Pour the egg mixture over the bread and fruit. Cover with plastic wrap and place in the refrigerator, allowing the bread to absorb the liquid for up to an hour, if you have the patience. Remove the plastic wrap and sprinkle the slivered almonds on top. 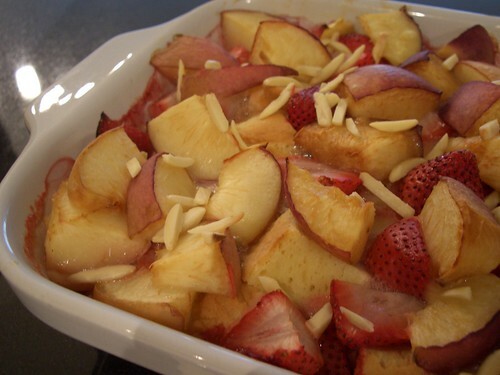 Bake for 45 minutes, until the almonds are toasty, the fruit is bubbly and the stratta is set. For the record, I’d just like to mention that I’ve made several loaves of bread since this. All of which have risen.